Please be aware names have not be changed to protect anybody. His latest musings will be at the top of the page, and just keep reading if you wish to follow the story back to time immoral. The highlights and lowlights of my first year; or why? Part the seventh – The highlights and lowlights of my first year; or why am I getting up at 5am and why do my feet hurt so much? At the end of my last musings I promised a review of the highlights and lowlights of my first year, well it’s been just over 12 months since I started on this journey and to be absolutely honest I have enjoyed every step (single, double and twisty back), so it is very difficult to pick highlights. .……………(long pause like they do on the telly)……………. 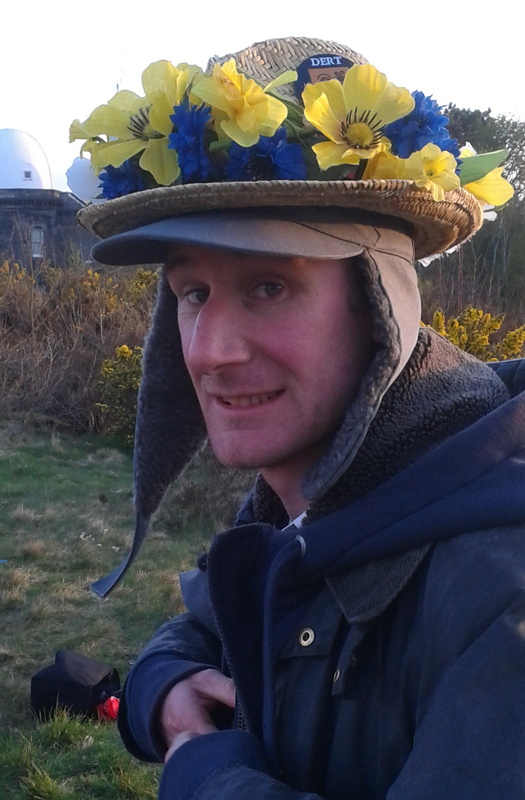 5.24am on 1st May when the sun broke the horizon over Liverpool and we were dancing at the Observatory on Bidston Hill during the traditional ‘sun-upping’ ceremony. And about 10.30am on Saturday 8th June at the Beechenhurst Lodge Visitor Centre in the Forest of Dean when I joined in my first mass dance with about 80 other dancers. As for lowlights, I think there have only been two. The first was the realization that I should have started doing this years ago and that as a result I will probably never be as good a dancer as I would like to be. The fact that my feet are taking a long time to get used to the pounding they get when dancing and as a consequence sometimes hurt like hell after a day of dancing. And before anyone suggests a change of shoes I took three months finding the ones I have and they were the softest I could find, and they have gel insoles! Well that’s it for this time – I know it’s short and how much you enjoy these musings dear reader – but there you are. Oh! I’ve just remembered, the other highlight of the year was meeting all the welcoming, friendly and generous members of Mersey Morris Men!! Next time: some vital statistics about those members. Of Dragons in the forest and Dolphins amongst the cow pats; or when is a ring not a ring? Part the sixth – Of Dragons in the forest and Dolphins amongst the cow pats; or when is a ring not a ring? At the beginning of June for the last 42 years the Forest of Dean Morris Men have hosted a weekend of dance and general merriment in the beautiful setting of (surprise, surprise) the Forest of Dean. The important thing about this is it is not A Ring Meeting. Let me explain a little bit of history, dear reader. In the 1930s Morris dancing was seeing a bit of an upsurge of interest and in 1934 the Cambridge Morris Men invited other sides to join them in the formation of a national organisation, the result was that five of the revival clubs – Cambridge, Letchworth, Thaxted, East Surrey and Greensleeves – met at Thaxted in Essex on the 11th May to inaugurate The Morris Ring. This existed quite happily for 30 or so years until during the 1970s some ladies were found to be dancing Morris – shock horror, how dare they!!?? The Morris Ring in their infinite wisdom decided this was totally against the tradition of Morris dancing and would not allow these dancing ladies into their esteemed organisation – and it still doesn’t. It took them many years to even allow sides with lady musicians (like ours) to remain as members. So the ladies being ladies said a collective ‘sod you then’ and formed their own Women’s Morris Federation in 1975. In 1980 they opened the Federation to mixed sides and a year later dropped the ‘Women’s’ from their name and are now open to any Morris side to join. Their website can be seen here. Why I said that it was important that the Forest of Dean weekend is not a Ring Meeting is that it welcomes all sides and their families (unlike A Ring Meeting – more of which later). There were around 120 Morris men and women at the meeting and a large number of family members as well. Attending the meeting has become something of a Mersey Morris tradition and 32 of us went. We all arrive on the Friday night at the recreation ground in the village of Upper Soudley, some were camping and some stayed in local B&Bs. The current Mrs King being the type who likes her home comforts shunned the idea of camping and we stayed in the Ship Inn in the nearby village of Newnham. The Friday evening is a chance to renew old acquaintances and make new ones over some very good food and a pint or two of local ale. The Saturday dawned bright and sunny and we all gathered to get on one of three coaches that would take us on a tour of the local villages (and pubs) throughout the day. Because there were so many in the Mersey contingent we virtually had a coach to ourselves, but were joined by the excellent ladies of England’s Glory and a couple of chaps who were on their own call Billy-no-Mates and Clive. We started with a mass dance at the Beechenhurst Lodge Visitor Centre where every side took turns to dance and we had a couple of mass dances that we all joined in. This was my first experience of dancing with more than 7 others and, sad though it may sound, I found it really exciting. Below is a taster but many more photos can be found here. We then spent the rest of the day touring the local villages. Because the organizer had decided we would dance a rota at each pub of us, England’s Glory, us; we danced 2 out of 3 dances with Billy and Clive chipping in with the occasional, very good jig. As a consequence we were all pretty knackered by the end of the day. Fortunately there was nothing more tiring to do in the evening than eat a hog roast and have a drink in the pub while being entertained by about 30 musicians. The Sunday morning again dawned bright and we gathered to walk half a mile or so down the road to the Dean Heritage Centre where again each side danced in turn and we did a few mass dances. Again it was really fun. We were joined by a couple of extra sides who had not been with us on the Saturday, including this lot who had their own particular way of bringing Morris into the 21st Century. They are called Wild Oats and I think you can see why!! Now, dear reader, I promised you talk of Dragons in the forest; well I lied as there was only one! But very fine he was. 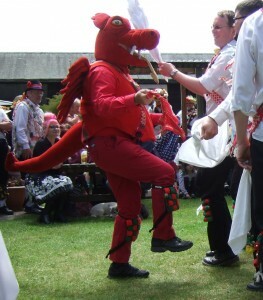 He apparently belongs to Cardiff Morris Men and I’m told he is reasonably well trained. All in all the weekend in the Forest Of Dean was fabulous and the current Mrs King and I can’t wait till next year. I also promised, dear reader, talk of Dolphins among the cow pats, so here goes. In Nottinghamshire there live a group (or should that be pod?) of dolphins. They are very nice, friendly dolphins and dance very well. They are the Dolphin Morris Men and they hosted my first experience of A Ring Meeting. Now when I first heard talk of A Ring Meeting I was a little bit confused as I wondered if I was going to be meeting Bilbo Baggins, Gandalf, Gollum and so on. And do you know, having now been to A Ring Meeting, I wasn’t very far off! The Meeting took place in the very pleasant, rural village of Sutton Bonnington. It is a quintessentially English village with a couple of pubs, a couple of churches, a couple of shops and cottages-with-roses-round-the-doors and it is surrounded by ruralness. This means fields. The current Mrs King was not invited, nor was any other family and/or friends – these are strict dancers and musician only events – and we were camping, in tents. Now I assumed, not unreasonably, that this would mean a campsite with toilet and shower blocks. Oh no, not here. This was a field that was usually the home to what are I’m sure is a very nice heard of cows. The problem is that they had only vacated it the day before and areas of it were still steaming. Once we had steered our way through these and found enough cleanish grass we made camp. The ‘facilities’ consisted of loos and showers of the porta- variety and a small marquee that had tea/coffee making facilities and a barrel of beer – arguably the only civilised thing there. Oh, and it started to rain! The format was very similar to the Forest meeting with a meal and drinks on the Friday and then off for a couple of coach tours on the Saturday – but this time it rained quite a lot. The main difference is on the Saturday evening when there is not just food or even a meal but a feast! We all had to stay dressed in kit and we all had to gather together. Tables had been laid in the church hall and we were waited on by members of the Dolphins MM. The food was very nice and the beer flowed very freely. We even all had our own bottle of specially brewed beer to take home. After the meal, sorry feast, we then got to the speeches. I haven’t mentioned that a couple of the Officials from The Morris Ring were present for the weekend – the Squire and the Bagman – and the first to his feet was the Squire. Then the Squire of Dolphins got up and thanked the Squire of the Ring and proposed some toasts. The first to the Queen (I hadn’t noticed her come in) and then to Cecil Sharp. “Who he?” I hear you cry, dear reader. 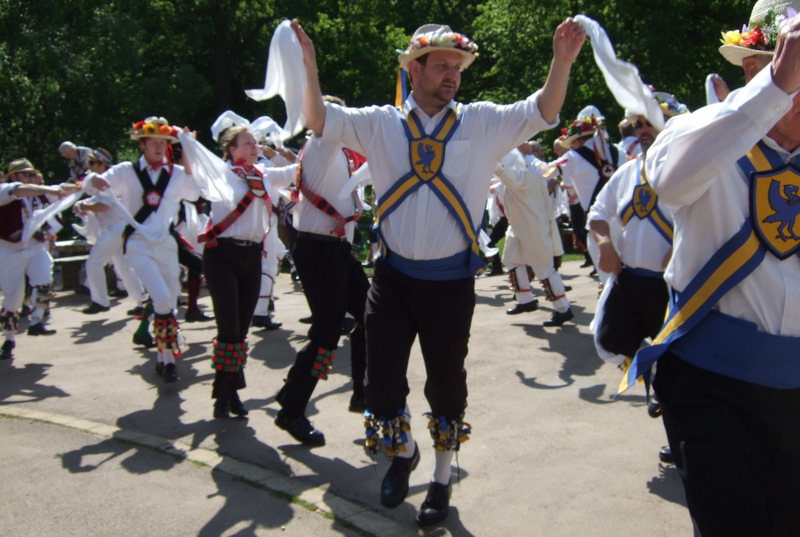 Well, in Morris circles (or rings) he has God-like status for it was he who spent a large part of his life writing down the dances and tunes that had previously only been handed down through local tradition, that now form the basis of all that we do. Then someone else got up and thanked the hosts for the weekend and then someone from the hosts stood up and thanked the thanker, and then someone else… you get the idea, I’m sure. Fortunately by about 10.30 the gently sound of snoring roused people sufficiently for them to realise there was a pub to go to, so we did. Such, apparently, are the quaint traditions of A Ring Meeting. Another quaint tradition is that of the church service on the Sunday morning. The purpose of this is to bless the Staves. What? When a Morris side applies to join and is inaugurated into The Morris Ring, they are given their official Staff of Office. This consists of a length of broom handle about 2 feet long with some ribbons tied round it. At the service they are all placed on the altar in church and blessed. And then, of course, the hosts do a little dance! Each side then had a couple of dances outside the church (in the rain) before the procession to the pub for more dancing and a hog roast lunch. But, dear reader, this being Morris we didn’t just walk – oh no! – we Winstered. Your challenge, dear reader, is to find out what this is. Answers on a postcard to the usual address. In the end, despite the rain and the speeches, it was a very enjoyable weekend and I look forward to more in the future – they just need to be taken a bit less seriously! Next time: A year since I embarked on my quest to become a Morris Dancer – the highlights and the lowlights. The end of the practice season and the start of the summer season; or why am I up at this ungodly hour? Part the fifth – The end of the practice season and the start of the summer season; or why am I up at this ungodly hour? I can’t believe I have done my first summer season of Morris dancing! And survived virtually unscathed! So much has happened and I have been very remiss and not kept you, dear reader, up to date with what has been going on. As penance I will beat myself with sticks wrapped in hankies! In this instalment I will take you through till the end of May as although I know you hang on my every word, dear reader, I don’t want you to have too much excitement all at once. So what has been happening? I hear you mutter. Well since my last instalment, which went up to New Year, I suppose the most important news is that I am no longer the newest Mersey Morris Man. That dubious sobriquet now sits on the shoulders of Bob – seen here at about 5.30am on May 1st (more of which later). 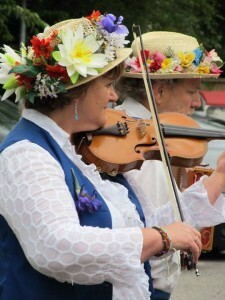 We have also been joined by Sarah who has added to our orchestra with her wonderful fiddle playing. This is she. Incidentally, she is also a vet so comes in very handy when one of us gets injured. Although it took us a little while to persuade her that ‘putting him down’ is not always the best answer. Both Bob and Sarah joined the side in January as we continued our winter training. This basically meant re-doing what we had done up to Christmas, with a few refinements. I was finding it easier to double step with more regularity and I was even remembering where to go and what to do when I got there. I was still not very comfortable with the hankie dances – I was finding I could either wave the hankies properly or do the stepping properly but not both at the same time. I much preferred the stick dances and was getting used to the various choruses – which are when you hit each other with the stick. Well you should really hit the other sticks rather than then each other. The first event of the summer season was our annual Ceilidh held in Neston on the last Saturday in April. This was a great evening of country dance with around 120 people enjoying the evening. We did a couple of dances as well and I’m glad to report I did them more or less right. On the 29th of April we had our first evening dance out at one of the many wonderful pubs that can be found on the Wirral. It was freezing! There were a few very hardy souls who managed to stand outside and watch us do our thing, but it was a close thing as to whether the landlord sold more beer or hot soup! Two days later was the first of May. There is a tradition within the Morris world of what is known as Sun-Upping which involves finding a suitable vantage point to watch the sun rise over the horizon and to dance to welcome in the lazy, hazy days of summer. This meant getting up at about 4.30am, gathering at the car park of the Tam O’Shanter Urban Farm in Bidston and walking to the top of Bidston Hill ready for sunrise at just after 5.30am. We were joined in this mad pursuit by the good ladies of the Mockbeggar Morris (www.mockbeggarmorris.org) and a few local insomniacs who had nothing better to do. As you can see from the photo of Bob above, it was somewhat chilly. After about an hour of dancing we returned to the car park and made bacon sandwiches! It is true to say that this event went straight in at number four of the 10 Most Stupid Things I’ve Done In My Life (So Far) – but it was great fun and quite an honour to think that I was part of an event that was happening around the country and indeed around the globe. You can see more pictures of the day on our facebook page where you can also find lots of pictures of most of our performances. This meant I had been dancing on three of the last four days – my feet were killing me!! A few days later it was the first May Bank Holiday and to celebrate we had a tour of Parkgate, starting at the Old Quay public house, then The Ship and finally The Red Lion. What a difference a few days makes to the weather in good old England! It was a really warm afternoon with lots of people out enjoying the sunshine, having a stroll along the historic quayside and perhaps an award-winning ice cream from the famous Nicholls Ice Cream Shop. All in all it was a chance for the family Joe Public to have a lovely time. And then a bunch of strange people with bells on rolls up to spoil their reverie! Actually it was a great atmosphere and a good day out. We continued our Monday evening tour round the various pubs as the evenings got longer and warmer – well longer anyway – with the highlight of the month being Nev’s birthday. To celebrate the 80th birthday of our oldest member, a new dance was written by Richard our Foreman. 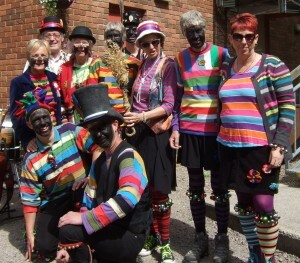 The dance received its world premiere at The Fox and Hounds, Barnston and has now become part of our repertoire, thus proving that Morris dancing is a living tradition. As the weeks progressed I was finding the dancing was if not getting easier, at least getting less difficult. I started to find the stepping was becoming more natural and I was concentrating more on some of the refinements, such as the twisty back-steps, the galleys and the hooky-legs. I was also becoming bolder, as I was prepared to ‘have a go’ at dances that I’d not tried before. Perhaps most importantly, I was still really, really, really enjoying myself. The next instalment, which I promise will be on these pages in the blink of an eye, will tell of days in the forest with dragons and of days with dolphins among the cowpats! Part the fourth – Boxing Day Revels and New Year’s Day Smarties; or how I did it in public for the first time. First of all, dear reader, I want to apologise for the tardiness of this latest offering. I won’t insult you by making excuses, suffice to say that the medication worked, the swelling has gone down and after a short course of therapy all’s right with the world again! But seriously folks; life just has a habit of getting in the way of our best intentions. Anyway, here it is for what it is worth. Cast your mind back, if you will, dear reader, to your family traditions on Boxing Day. Perhaps you were driving round franticly trying to buy some more batteries for Johnnie’s new toy, or you were (quietly) celebrating the fact that the in-laws were going home, or maybe just nursing another fine hangover after yet another successful family Christmas. If, however, you have none of these happy memories, maybe you were one of the 300 or more brave souls who made it to Willaston village green to witness the fine figures of the Mersey Morris Men carrying on their Boxing Day tradition. For 21 years now, we have put on a show for anyone mad enough to stand around for an hour or so. Not only are several dances, including some very good (if not a little strange) ones involving double-handled swords, performed, but the crowd also receive a complimentary and free cup of mulled wine and a piece of Christmas cake. Of course after we’ve given them this we go and drag a few shekels from their mittened hands to donate to the cause. I had very proudly carried the cake without dropping it (click to view this marvellous sight in the MMM Boxing Day image gallery) and then probably just got in the way until I was called to join in the last dance, Greenbanks. I was very nervous and this was not helped by Squire Tony introducing me to the crowd as the latest recruit to the side. I’d like to think I received what sounded like a round of applause, but thinking back it was probably just the sound of knees knocking as they shivered in the cold. Well, the music started and off we went at a cracking pace. I launched into the first figure (foot up and down twice – for those technically minded among you) with positive abandon and actually got it right. I then flawlessly ‘sticked’ my heart out in the chorus. I was really starting to enjoy myself as we entered the next figure (back-to-back) and off I went step-hopping like a seasoned pro. Another chorus successfully negotiated without mishap or broken fingers and I was in the zone, as I believe it is termed these days. The penultimate figure was again performed like I knew what I was doing, another chorus nailed and then the final figure, the hay. Dear reader, I blush to recall it. There was clearly a sudden short circuit between brain and feet. I hopped when I should have stepped and stepped when I should have hopped. I went out instead of in, up instead of down and generally cocked it up. I was mortified, sick as a parrot and generally rather peeved. My only hope was that people were thinking too much about a warming libation in the Pollard Inn to have noticed. However, I didn’t half enjoy myself, even though I’d made a bit of a mess at the end. Of course, my fellow dancers were all very kind and complimentary and the current Mrs King thought I was wonderful (and so she should) but I knew I had a week to think long and hard about it before my second public performance at the Plaster’s Arms in Hoylake on New Year’s Day. So a week later most of us met again at the fine little pub called the Plasterer’s Arms for lunchtime. Now if you don’t know it I can recommend it as they keep a very good pint and are well known for their folk music nights. I was very pleasantly surprised to discover that a lot of their regular ‘folkies’ had turned up as well and after we had danced for an hour or so the afternoon turned into an impromptu folk jam session. Most convivial! Oh and the dancing went well, too. This time I managed Greenbanks with no problem (well pretty much) and even had a go at a couple of other dances with reasonable success. I still haven’t reached the point where the stepping ‘comes naturally’ but at least it was getting easier. Oh, by the way, I still haven’t had a satisfactory explanation as to why double step is called double and not triple (see part 2). Well that’s all for this instalment. Happy dancing! After four or five weeks they stopped saying in a rather surprised manner, “so you’re here again, then”, and realised that I was serious about this lark. Now, dear reader, this might be because I was learning a new skill/art, it might have been because of the fun, laughter and camaraderie we have each week, or it might be because during the summer we go to different pubs each Monday night to drink and dance (or should that be dance and drink?) and to various weekends away to dance and drink and dance. After a couple of weeks Alan, one of the very experienced dancers, had been watching me and gave me a little advice. He said that when I was single stepping I was doing it the ‘wrong way round’. Now, dear reader, you will recall that single stepping involves a step and a hop and my problem was I was doing a hop and a step. Like me you might be wondering why this makes a difference. Let me explain: if you start with a hop when everyone else starts with a step you are going up when everyone else is going down and down when they were going up. Think about it (but not for too long), dear reader, and you will see what I mean! In fact why not come and join us any Monday evening at Thornton Hough village hall and try it for yourself!! Having received this advice and after a couple more weeks I was learning that while I could normally cope with the single stepping and I was starting to learn different figures and choruses, I was still finding the double stepping very confusing. I would start off fine and then all of a sudden it would go completely to pot. I would be hopping instead of stepping, or not hopping at all, or jumping, or anything other than what I should be doing. I was really starting to doubt my ability to count to three! To complicate matters further, in some dances you also have to do a caper or a side step or a twisty back step or even a hookleg. More on these in future musings. Suffice to say it was far, far, far more difficult than I had first expected it to be. But it was also still very enjoyable, particularly when I managed to get things right, even small things. I was, however, reassured when I was told by several of my fellow dancers that I will reach the point when suddenly it ‘clicks’ and I’ll do it without thinking – I look forward to that day. I was also told not to worry about it because the first 25 years are the hardest! After about six weeks when I arrived for the evening, the lovely Eve came up to me and said, “I need to measure you for your baldricks.” Now, dear reader, I didn’t know what a drick was and I certainly wasn’t sure I wanted any for my ba… down there! However, she soon explained that these are the coloured shoulder sashes that we wear. I took this as a great compliment that they obviously thought I have the potential as a dancer. She also explained that I needed to get some black trousers and get the wife to turn them into breaches, a white shirt, long white socks and a straw hat (which Andy the Bagman could provide) which needed to be decorated with flowers. The following week the lovely Eve brought my baldricks. Oh, dear reader, I never knew I could get so excited about two lengths of blue and yellow ribbon, a blue and yellow rosette and a small embroidered emblem. She told me the lengths of ribbon are worn diagonally from shoulder to waist with the rosette at the back and the emblem at the front. See picture below to see what I’m going on about. Andy had also brought a straw hat for me and some bells and one of the other dancers, Arthur, had brought his bell-pads to show me how to make them. Now being a bit of a crafty sort I took myself to a garden centre to buy some artificial flowers and to Abakhan fabric shop to buy some leather and set about the task of putting together my outfit. Doing so I spent several jolly afternoons and perhaps, dear reader, you can judge how successful I was by this picture – but keep your comments to yourself!! The next few weeks were spent concentrating on the programme for the annual Boxing Day Revels in Willaston (see pictures elsewhere on this site). I knew I was not of sufficient standard yet to be able to do any of the dances, but I was hoping to be involved somehow. Imagine my excitement then when one evening Squire Tony told me I would be carrying the cake! He then added that if I try really hard I would get to dance Greenbanks. Imagine how I slept that night – no don’t. Well dear reader, that’s about it for this instalment, don’t miss the next one when all will be revealed about the Boxing Day Revels and the New Year’s Day Smarties!! I thought all I’d do is just stand around watching them and have a swift half at the end of the evening and that would be that. How wrong I was. First of all I was greeted by the two gentlemen I’d met on Saturday and learnt that they don’t wear bells all the time and that they were named Phil and Nev (the two gentlemen not the bells). Second I was introduced to a gentleman called Richard and was told he was the Foreman who did all the teaching. Another 16 or so gentlemen and one lady, the lovely Eve, arrived and Richard introduced me to the rest of the group – or as I was told – the ‘Side’. This immediately caused problems as there was another gentleman called Matthew so I was christened Matt 2. We were gathered in a circle and the musicians, who included Eve on violin and three or four gentlemen on accordion type things, were asked to play a tune. 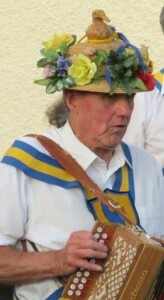 I was told by Richard that there are two basic steps in Morris Dancing, the single-step and the double-step. Sounds simple enough, I thought. He asked if I could skip. I said I could when I was five years old. It was then explained that single-step was a bit like skipping but instead of it being ‘hop, step’ it was ‘step, hop’. The subtlety of the difference may not immediately strike you, dear reader, but believe me it is very important. I will return to this at a later date. He also said that whereas in skipping the non-hopping foot tends to be lifted behind the hopping foot, in Morris it is lifted in front. We then started to single-step on the spot in the circle to the music. I initially felt a bit of a fool but then realised that everyone else looked just as daft as I did, so I got on with it, if not with gay abandon then at least with less self-consciousness. After a couple of minutes of this I realised two things. One, it was actually quite hard, and two, it was knackering. So we started to double-step on the spot in the circle. That is to say they all started to double-step on the spot in the circle. I really don’t know what I was doing. Sometimes I managed to do it a few times then my brain seemed to lose the ability to count to three. Fortunately we didn’t do it for long, Richard put me out of my misery and was very complimentary – I don’t think he had been watching. Richard then told the side to get into two sets of six men as they were going to demonstrate a simple dance called Greenbanks that they get new members to do. I was to watch and then have a go – yeah right. This involved hitting the floor with the stick twice, then hitting your opposite man’s stick twice, then the floor again and then the other stick three times. Then we single-step half way round a circle and do it all again. We did this a couple of times and by some miracle I still had the correct number of fingers and more importantly so did my opposite number. We then spend 15 or 20 minutes going through the figures individually and then we put it all together as a dance. Not wishing to blow my own trumpet, but I was rather pleased with the result. I hadn’t tripped up, I hadn’t fallen over, I hadn’t hit anyone with my stick and I only went the wrong way in every figure. But I did get the chorus right – well nearly. Much more importantly – I had thoroughly enjoyed myself. After this the rest of the side got on with practicing another dance and I thought I had been transported to another world with talk of gips, half-gips, back-to-backs, hooklegs and capers. After a cup of tea when I was introduced to Tony the Squire and Andy the Bagman and another hour’s dancing when I stood and watched, Richard said we would finish the evening with another go at Greenbanks. OK I thought, I’ll show them. Oh, dear reader, it was awful, pathetic, pitiful. But we all had a damn good laugh. I was then invited for a drink in the Seven Stars public house; purely for rehydration purposes I was told. Who was I to argue? I quickly realised that not only are the Mersey Morris Men very good Morris Dancers but they are also very good company. I went home to my dear wife who had got me into all this and was able to tell her I had had the most enjoyable evening with my clothes on for a very long time. It was a normal Autumn Saturday in early October and it was raining. For want of something to do, the current Mrs King suggested we go to the craft fair being held in Heswall as part of this year’s Heswall festival. I think she was trying to hint it might be an early Christmas shopping opportunity. As we were dodging the puddles she noticed a couple of gentlemen, well more accurately she heard a couple of gentlemen, walking down the street in what she assumed was Morris Dancing attire. I hadn’t noticed/heard as I was concentrating on trying to think of a way of cutting short the visit for something more interesting, like cutting the front lawn with a pair of nail scissors. However, she chose to interrupt my reverie with a cheery “You’ve said you’ve fancied having a go at that haven’t you.” To which I muttered something about probably being tired and emotional at the time. Having spent a seeming age but luckily not a fortune communing with the crafty people of the Wirral we headed back into the (hopeful) sunshine only to be greeted by more rain. While struggling with the brolly we almost literally bumped into two more similarly clad gentlemen. One was about seven feet tall and the other had a duck on his head. Muttering my apologies and trying to scurry on my way I suddenly heard she who must be displayed shout “Go on ask them about joining them”. I was trapped. I tried to escape but heard the tall one telling my now possibly short-lived beloved that they were a local group that met on a Monday evening in Thornton Hough Village Hall. “But I can’t dance” I said. “I’ve never been able to dance” I said. “I’m allergic to bells” I said. “See you on Monday then” he said. And that was it. Off they went jangling their bells with every step as if it was the most normal thing in the world. So Monday dawned with a far too cheery “Are you going tonight for your first foray into the ancient English tradition?” from the other side of the bed. “I’ve told you I’ve given up my days of football hooliganism,” I replied. I tried to explain that I was very tired after a fraught night’s sleep interrupted by dreams of men covered in bells hitting me with sticks while pouring pint after pint of foaming real ale down my neck. “Nothing unusual there, then,” the soon-to-be ex-current wife joyfully replied. As the evening drew nigh I tried all sorts of diversionary tactics – I even got the Hoover out – but I realised I would never be a man again in her eyes if I didn’t go. “What’s the worst that can happen?” she asked. “Splintered chins from the clattering of the bells and a cracked skull from being thumped with the sticks” I nervously replied.